MANILA, Philippines - President Rodrigo Roa Duterte reports his first State of the Nation Address (SONA) today, July 25, 2016 at the Batasang Pambansa in Quezon City. The official livestream video feed by Radio Television Malacañang (RTVM) is now available online. President Duterte will deliver his speech in front of 293 congressmen, 24 senators, former Philippine presidents and guests at the opening of the 17th Congress. It is mandatory for the president to deliver the annual SONA according to the Constitution. 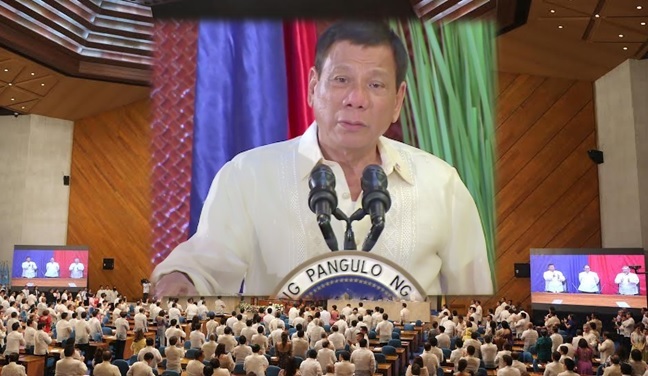 The address of President Duterte will be the 78th since 1935 and the 30th since the restoration of democratic rule under the Fifth Republic in 1987. In it, the Chief Executive reports on the state of the country, unveils the government’s agenda for the coming year, and may also propose to Congress certain legislative measures. Major television networks ABS-CBN, GMA-7 and TV5 have their own coverage and livestreaming of the 2016 SONA. Once available and possible to share, it will be embedded here. The Palace earlier mentioned it wanted to center on the President's message to the people. On Monday, there will be no blame game as compared to previous administration's speeches on SONA. It is expected to tackle suppression of crime and illegal drugs in 3 to 6 months, wage hike for police and military, elimination of red tape, peace talks in Mindanao, federalism, abolition of contractualization, conditional cash transfer (CCT) program sustainability, hospital facilities for poor patients, livelihood and agriculture, improvement on Metro Manila transportation, creation of more jobs, resolution of West Philippine Sea dispute and establishment of OFW department. In general, SONA highlights the different aspects of the nation such as economy, jobs, asset reform, education, sports, government and ethics, health and environment, tourism, justice, urban poor, issues in Mindanao, foreign affairs and national security. Same in previous years, The Summit Express will also provide SONA review for student's reaction paper and upload the President’s address full transcript (English and Tagalog ) on this page later today. Like Us on Facebook and Follow Us on Twitter for more updates.